We were quite thrilled when we saw that this tour was announced and after our experience in Birmingham at the Symphony Hall (November 2014) we bought our tickets for Birmingham and Northampton the moment they went on sale. This tour saw promotion for the recent album Wolflight as well as early solo material due to the release of the extensive Premonitions boxset. Delving into a hefty volume of his earlier career as well as a Genesis set an extension on his previous outing. Whilst Premonitions was slightly delayed we did pick up a copy, purpose of the tour served then. Whilst some people shy away from spoilers before they see a show themselves I couldn’t help myself. I had my friend Lamia explain about the two nights he and his wife saw in Zoetermeer at Boerderij (The Farm). 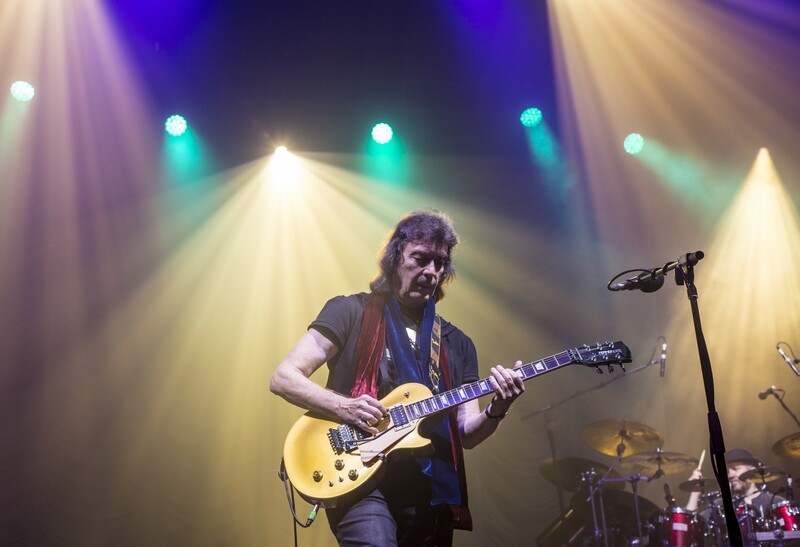 Steve Hackett had played the same venue in Zoetermeer back in 2003 and more recently in 2009 and 2010. He even asked me had I seen the YouTube video of the full show from Zoetermeer online to which I admitted that I had and I found it an exciting warm up before the tour. We set off for the gig early and after a few errant choices at roundabouts we eventually arrived at the gig in plenty of time well just after 6pm, our newish but noble car served us well (It’s a Skoda for those who might be interested). 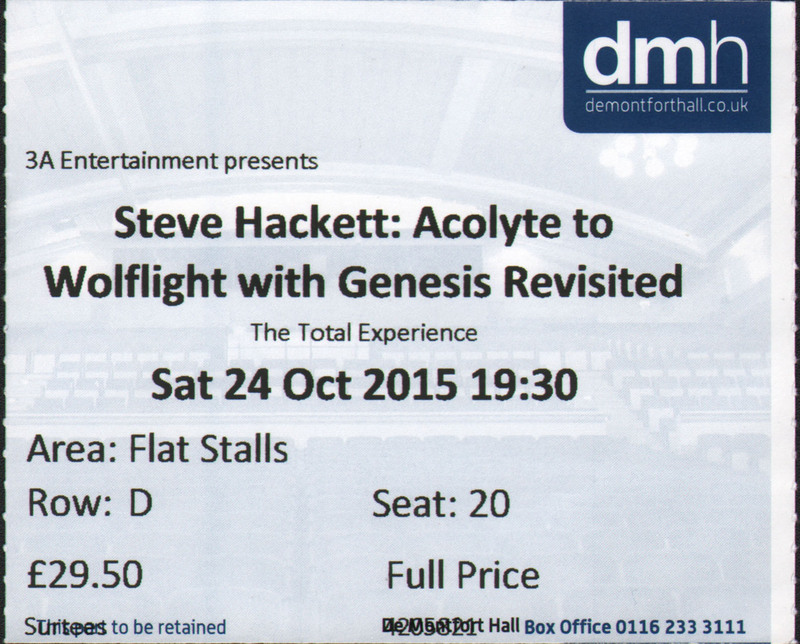 Steve Hackett is rather familiar to The Derngate theatre having played here in 1983 and 1988 with a more recent excursion in March of 2004. 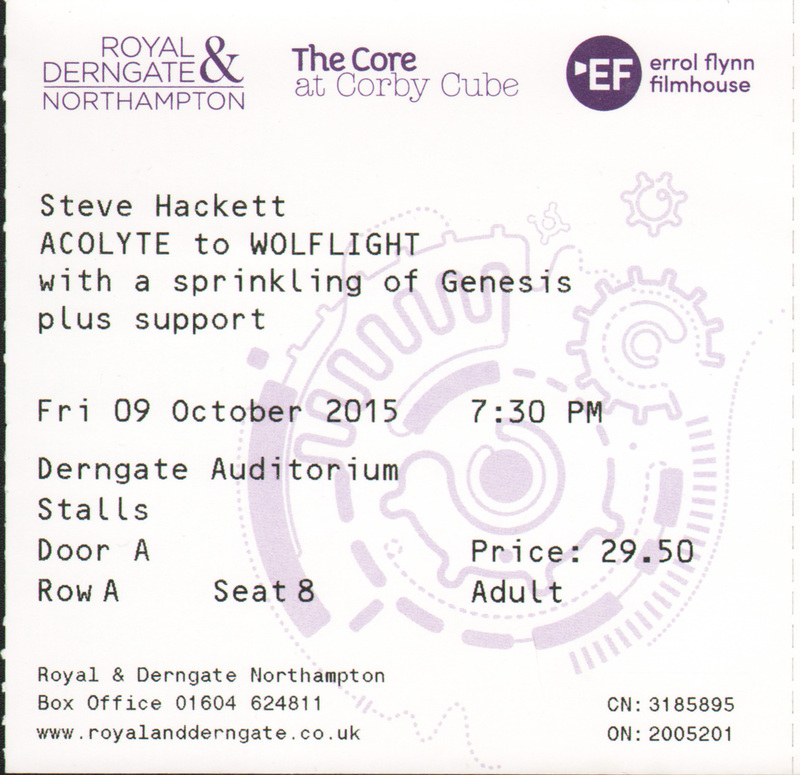 I had previously seen Steve at The Derngate theatre in March of 2004, the venue was different in my memory. I suspect they must have updated the foyer in particular. We made our way to the stage door for a prearranged interview but we we’re informed by the tour manager that Steve was over running with the pre-show meet and greet packages so we put in a pin that for the time being. After a quick drink; half a pint of Pepsi for the driver; we set off to find our seats and once inside the auditorium we bumped into Ben the sound engineer. After a quick chat, during which we established he had forgotten doing the live sound in the same venue 11 years earlier, he promised us that we would find the surround sound experience interesting so we left him to get on with his pre show checks. This was something we initially weren’t aware of – intriguing. Discovering our seats it was only then that we noticed that we had incidentally picked the prime spot in front of Steve, an intricate view for any aspiring guitarist to have. The show began with the stage cast in near darkness and the eastern Europe flavoured Corycian Fire from Wolflight served as entrance music began; clearly the Djabe influence is rubbing off on Steve. As the guys entered the stage under the cover of red glow time was in suspense. In no time at all, Spectral Mornings exploded into life like a bolt of lightning with a blinding flash of light to accompany the crash of cymbals and Marshall amps to 11. Show number 1 was out the gates galloping down the track. It was nice to hear the raw energy of Out Of The Body, starting off with the baying wolves and moving into the kind of instrumental sound that showcases Steve’s huge Eastern influence. The song segues into Wolflight with a seamless transition. 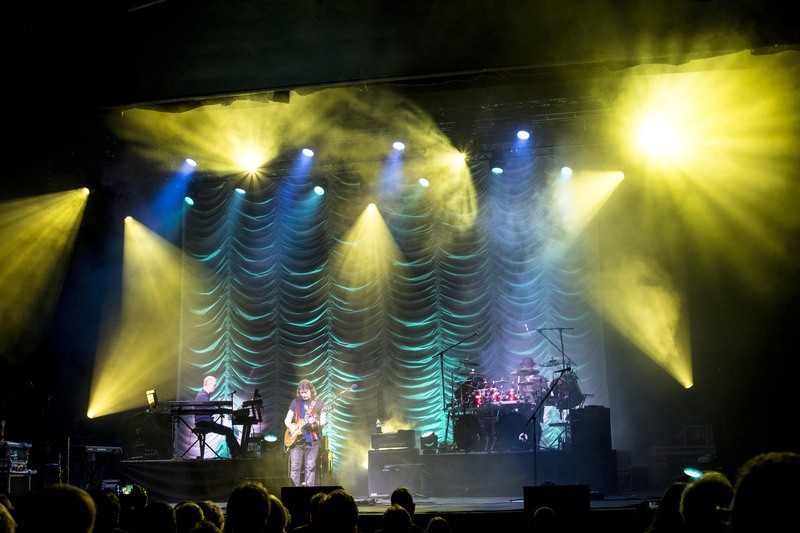 The Loving Sea, saw Steve enter the stage with his Zemaitis 12 string guitar and Gary emerged from behind the drum kit to take on backing vocals as well as hand percussion duties, it was a lovely moment with the stage cast in a soft blue hue much like the sea in the title of the song. Steve during The Loving Sea, nice 12 string playing! There were a few technical gremlins mostly connected to either a guitar lead or something else with regard to Steve’s pedal board or chain, that said Steve did eventually laugh these off and he recounted the stories he had been told about a lady apparition who haunts the venue and comes to life during some performances. 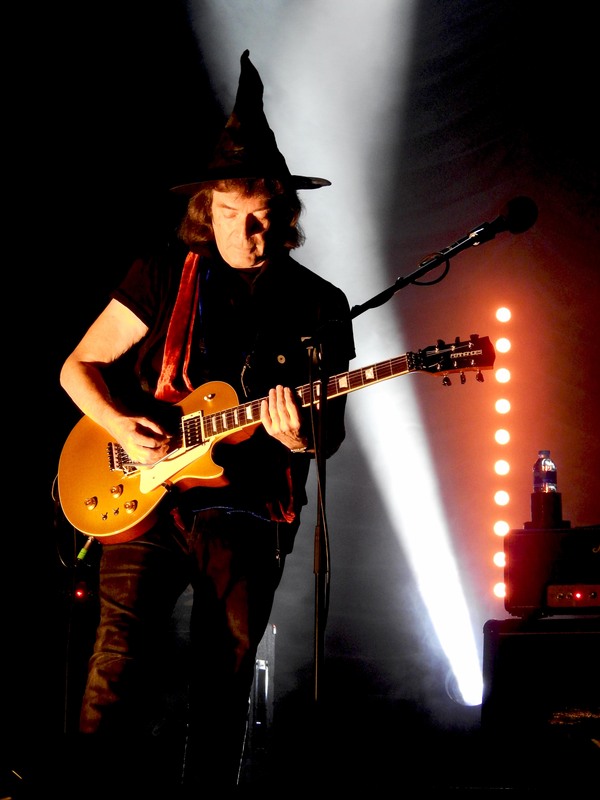 Steve decided to formally invite her to the show in the hope he could exorcise the gremlins, seemingly doing the trick, although long serving guitar tech Richard Buckland did indeed take a more detailed look at the pedalboard during the interval. Nad’s singing was on full tonight with his amazing vocal range. Imitating the burbling low growl of Richie Havens during Icarus Ascending, which was a surprise as this was the first live performance of this classic, then moments Nad is straight into then the higher pitched and formant pipes of Phil Collins during Star Of Sirius which can only be described as an athletic feat! 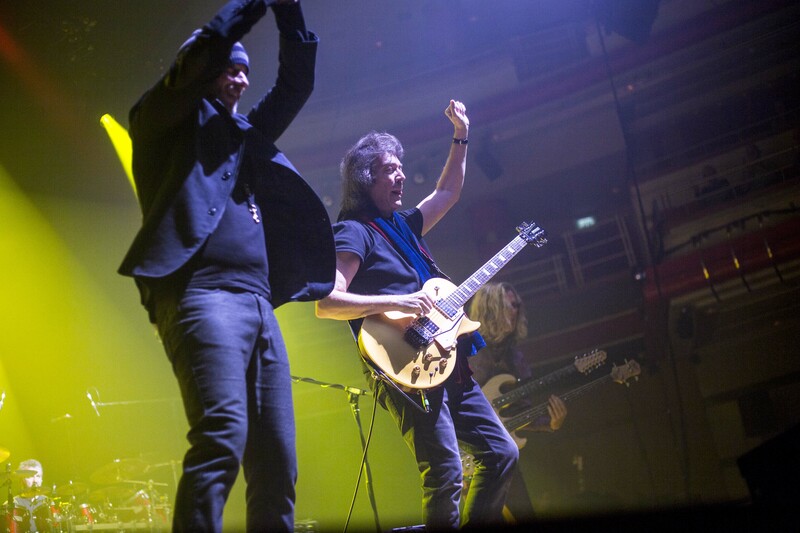 Nad did indeed return after the interval and he sang the Genesis classics that make up the second half of the show. This he did not so much in tribute to either Phil or Peter but with a relaxed style of his own that retained a flavour of Phil or Peter without being overkill or imitating. As much as a handful of naysayers dislike Nad, he can surely sing; belting and whispering where appropriate. Even more so he is every bit the front man of the show. He is no less zany or crazy for that matter than Peter was or that Phil was in the middle to late 1970s. Nad does not need to don the costumes of Peter either to carry off a vocal with emotion or the energy of Phil. 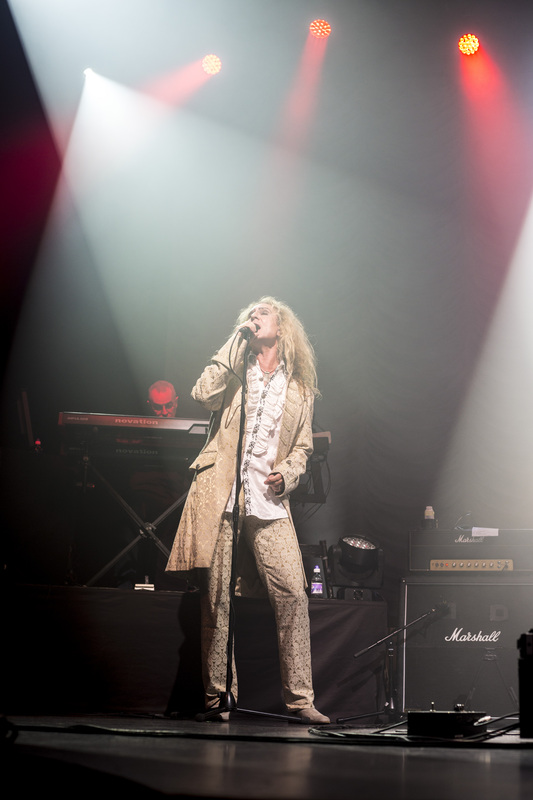 Nad has worked hard going from a relative unknown singer here in the UK to working exceptionally hard with Steve and his band since 2013 he is able to sing the songs with raw emotion and warm passion. He flares his arms and posture where appropriate and it’s tasteful yet emotive and the sign of a man doing the job he loves. Rob Townsend’s role in Steve’s band has expanded again this tour but before we get into that Rob did indeed mention with some encouragement from Steve that he saw Steve at the Derngate back in the 1980’s, Rob’s no longer the man with more wind than an autumnal gale but now also an additional keys man for when Roger King runs out of fingers and hands. 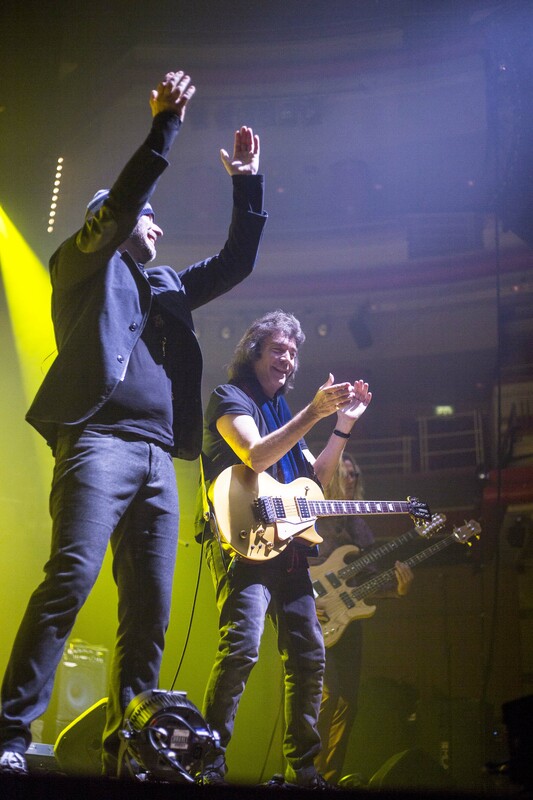 Rob has been known to do the extra bit of hand percussion previously, as Gary only has so many hands. Nevertheless, it was nice to see Rob reprise this role, especially during Everyday. Roine (above) took on the bass and double neck drawing comments from nearby patrons of the ‘authenticity’ of the show. Hopefully he didn’t mind me accidentally calling him Nad during the after show gathering (in my defence he had his back to me and like Nad he has long blonde hair). Nick Beggs was also in the audience tonight, Steve said so and Nick playfully remarked that he was. Nick is a lovely guy and brilliant bassist, strangely at the interval a woman from the audience accosted him as he was coming out of the gentleman’s WC and proceeded to praise him and ask him why wasn’t he on stage playing bass, he did try to explain he was already committed to tours with Steven Wilson & Kim Wilde. Roger King’s playing and arrangements cannot be bashed in any way shape or form, the man is practically reproducing an orchestra, synths galore, and effects that would flummox a mere mortal he even performs the full piano intro to Firth Of Fifth. Roger has persuaded another band member to the dark side. Rob Townsend also plays key parts on the occasional moment to fill the sound and ensure everything is thoroughly presented. Roger is infinitesimally difficult to photograph owing to an array of midi keyboards getting in the way and those lightning fast hands causing a blur to even the fastest camera shutters in the land. 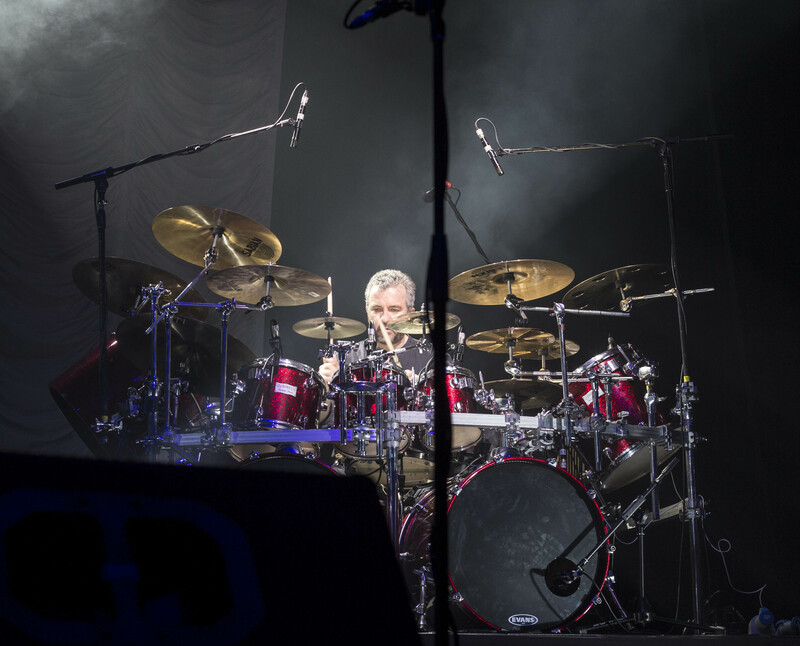 Gary O’toole during his drum solo in the middle of Clocks – Angel Of Mons. Gary O’Toole was rather energetic tonight, but then he is no slouch an interesting note that his drum and percussion set up had altered again this time with no Octobans. 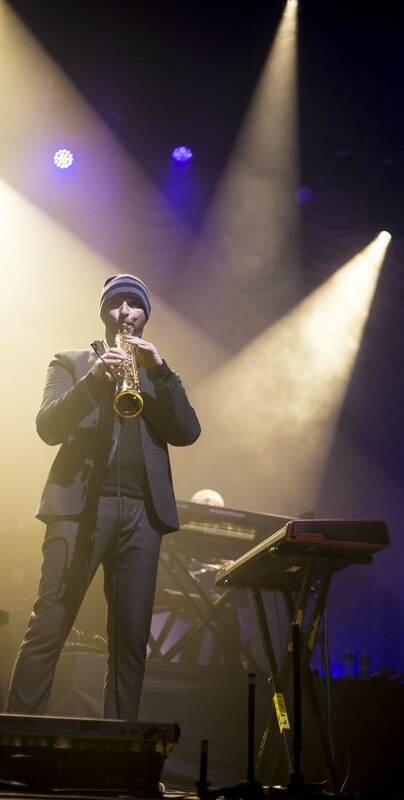 During each of the four nights Gary was able to inject some flair and signature into his playing making each night a different experience for those that attended each show rather than a scripted journey. He is also a nice guy with plenty of time for others. His kickstarter campaign was a work of genius mixed in with generosity for those with an interest in drumming and percussion. End of the show people start filing out. The new songs work very well in the set with an interesting choice from Steve, although one might assume the choices would depend on which of the new songs from Wolflight were the more straightforward to reproduce live hence the choice. Personally I would have liked to see Heart Song follow the Loving Sea but I can imagine some might have found that to be too much. Another surprise was the reprise of After the Ordeal in the set from the Genesis album Selling England By The Pound. 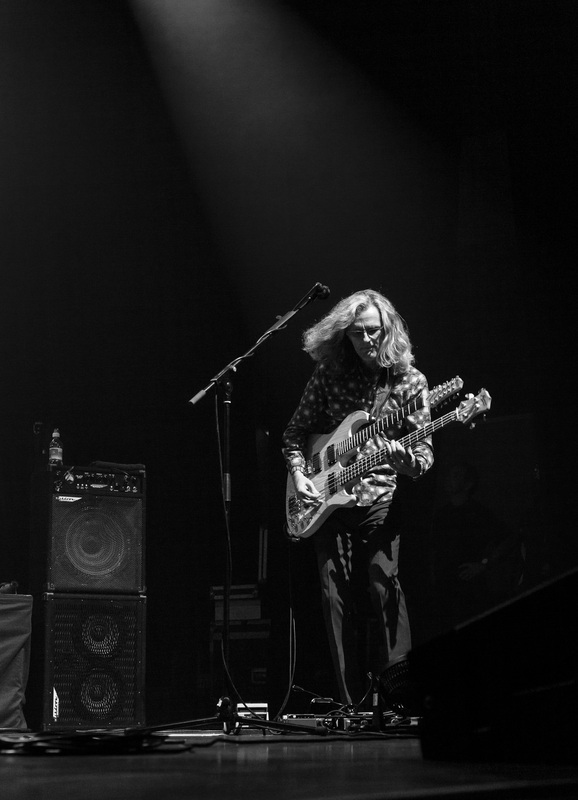 Previously performed by Steve as part of his Acoustic Trio Tour (2005) in a neo classical style. This time it was a respectful nod to the original complete with the light shade of acoustic guitar before the roll of the toms by drummer Gary O’Toole moving the chiaroscuro to the dark transition with electric guitar and heightened progressive rock. We had a wonderful talk backstage with Gary about his kickstarter project and it was nice to discuss elements of the show with him, just before we left we bumped into Steve who asked us what we thought of the show and we gave our views. I think I even remarked it was the best show that I had seen despite the gremlins earlier in the show. We discussed the DVD filming in Liverpool and how we thought based on tonight’s performance it might even be his best live DVD although it would have to go to some high level to knock The Royal Albert Hall concert film off the top spot, just before it was time to leave we had a moment or two with tonights special guest John Hackett and we mentioned how we were looking forward to his brand new rock album Another Life. An interesting note was whilst the lighting and immersive sound experience are wonderful it was tasteful they were not marred by a screen with graphics etc, Steve went for a more simple approach. After struggling to get into the after showing owing to the venue staff being confused about the validity of our wrist bands we soon went upstairs and made our way through the throng of people back stage. Time was short at after show gathering (with the shows now run back to back). As we said our goodbyes, we made our way to the car and soon found the M1. The next day my good friend Richard rang me up to ask how the gig had been and what I thought of the show. Avoiding any spoilers he listened to a short review. He equally had a great time at the gig in Glasgow. After the Glasgow gig I rang him the day after and we compared and chatted about his experience, he was surprised I was going to see more gigs but he remarked would have loved to have the opportunity. I had been to this venue a mere six weeks earlier to watch The Ukulele Band Of Great Britain who are a wild night out and worth a punt. This time I had to use the SatNav on my phone for the first time, the barmy thing took me past the Leicester Football ground just as they were letting out all the fans from both sides – bloody stop, start traffic. Approaching the venue and getting my bearings in order I noticed several fans already waiting for 6pm to come around so they could get the reduced rate for car parking but I didn’t want to hang around, nature calls. Ticket stub for the gig. My good friend Lamia (who bought the ticket for myself) was attending with his lovely wife coming from Holland, talk about keen fans. 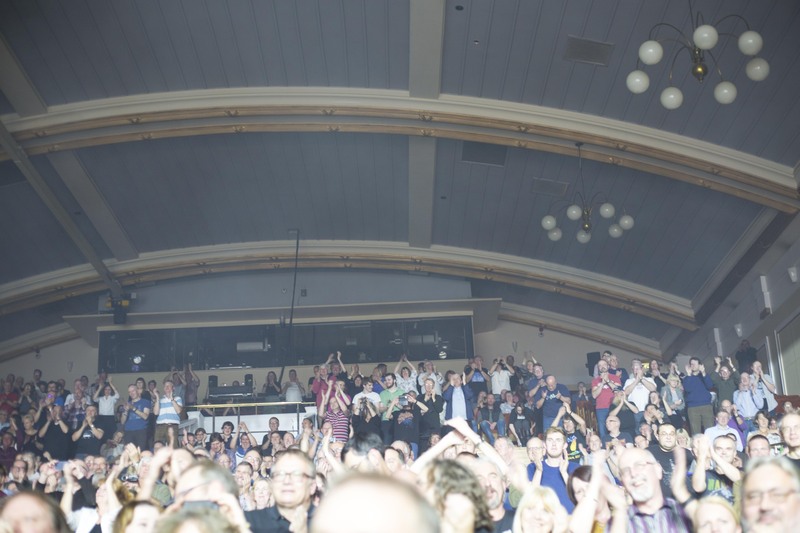 We had a catch up in the bar at DMH and we exchanged gig stories as they had already seen two shows in Holland and one in Belgium at the Ancienne in Brussels; a venue Steve had played in 1979 again on the recent Genesis Revisited tour. We both had a quick chat with Paul the merchandiser who was rather busy at this gig a lot of people were asking him about the new box set Premonitions despite it not being on sale owing to a lack of stock. People didn’t seem that disappointed because they brought plenty of programmes and t-shirts. After finding the bar and talking about the previous shows more, as well as one I had to miss (sorry Chris) we headed to the venue and located our seats. I also managed a chat with Ben on sound and Tigger on lights – this was their view for the night. 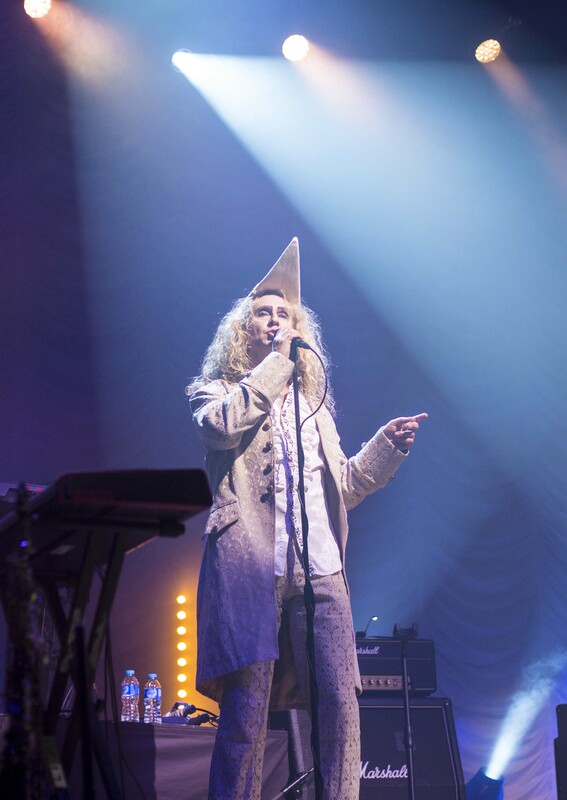 I returned to my seat and Lamia was rather chatty, especially as people were remarking about his jacket that his lovely wife had custom-made for him with elements of the Trick and Wind Genesis album covers. As the sell out show reached fever pitch, round 2 got under way. The show followed the same format as the show at Northampton complete with the same production elements, the lights darkened and the stage turned red the band entered the stage during the intro music and despite my prior knowledge the blinding flash at the start of Spectral Mornings still made me jump! 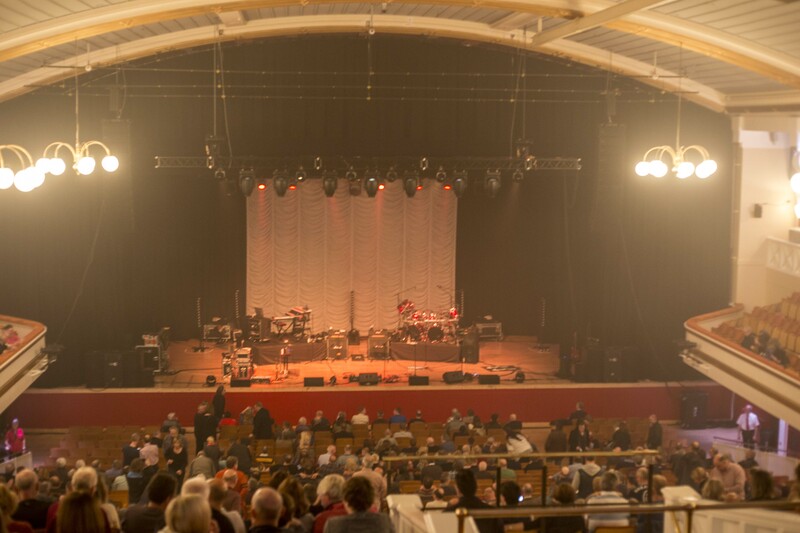 Steve has played the De Montfort Hall many times in his career first with Genesis in 1972 and then in early 1973 when Genesis Live was recorded here, also in 1977 with Genesis where they performed two shows that night, and then numerous times in Steve’s solo career. 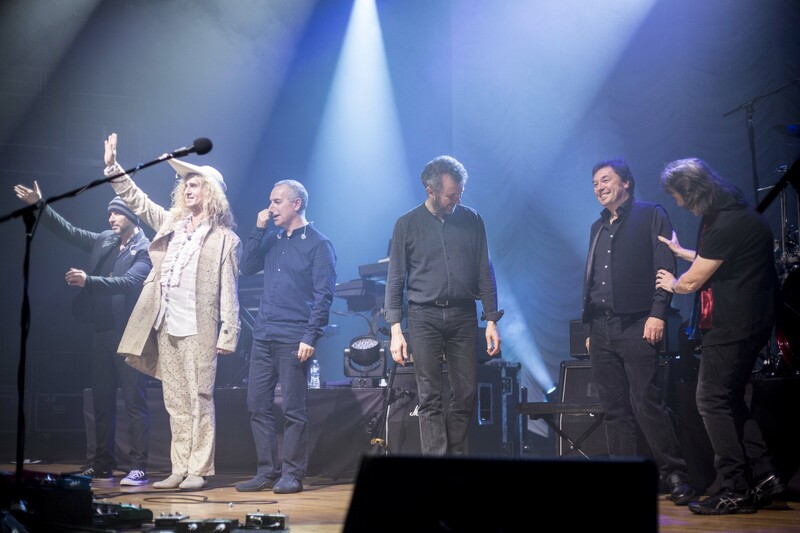 Thus it’s not surprising Steve brought some of his personal history with the venue to the audience’s attention between a song break in the early part of the set, during which a lively audience member tried to debate whether Genesis Live was either 1973 or 1977. That aside the band were introduced, plus special guest for this evening, Amanda Lehmann. The Wheels Keep Turning gave Steve a chance to take the audience into his fairground storytelling. The song’s intro being projected from rear speakers in the audience gave it an extra dimension and by then the immersion into the imaginary realm of the fairground was upon us all. Amanda added a lovely touch in the form of additional vocals. Quite amusingly Roger King had left the stage to go and get his glasses. 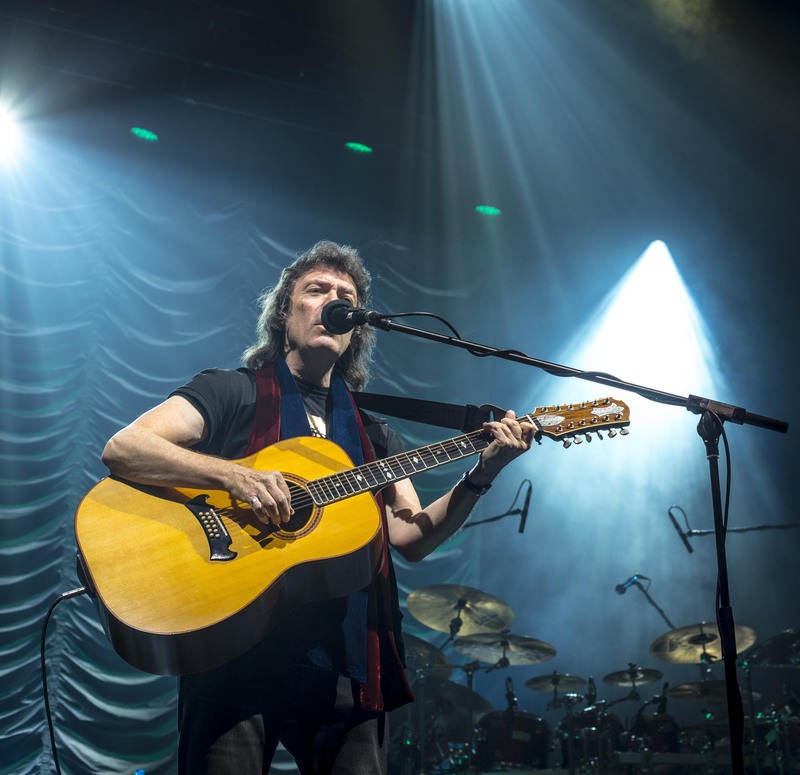 This was announced by Steve Hackett in the typical humorous way – “Message from the keyboard station” before the start of The Loving Sea, as it seemed Roger had forgotten them. Amanda Lehmann was a surprise guest with her either playing her red electric guitar or singing backing vocals on Everyday, Shadow Of The Hierophant, & Loving Sea. Through the grapevine we heard she was with the band the night before at Liverpool during the recording of the Live DVD, so it was a surprise to be treated to her appearance on this night of the tour. Fan favourite Ace Of Wands took the audience right back to 1975. Tonight’s performance of this classic felt different, whilst all the familiar elements were there it felt better in this bigger venue and far better than the version I recall being performed here back in 2003 although on this occasion I am not sure why the bit with the whistle sounded quieter than I expected it to be. But then Gary’s percussion onslaught turned from a gallop to an excitedly paced but controlled canter almost leaving horsepower behind and heading into the world of steam trains. Icarus Ascending sent the audience to 1978’s Please Don’t Touch. 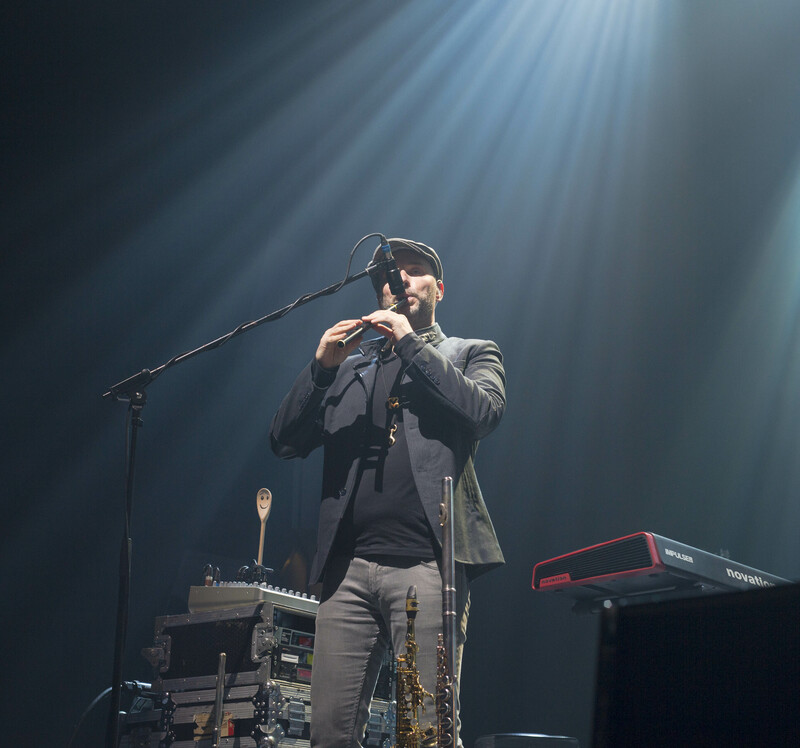 It’s great to see Steve bringing a song never played on a previous tour despite the fact that live it works wonders. With Icarus and Star Of Sirius Nad helms his take on the Havens and Collins (respectively) vocal licks and makes light work of them both. Shadow Of The Hierophant was another treat, Amanda sang this tonight in place of Nad and her dynamics added to the feminine touch of the original. With all the right bits in all the right places by the band it was another treat moving from one emotional shade into another then as the other band members subside leaving Roger King to play the tuned percussion sample and Gary O’toole adding a bit of drama by taking his hat off and catching the invisible cue at the right moment to hit his hand percussion whilst illuminated during a stage cast in darkness it was an amusing moment. The performance of the song becomes a crescendo on the verge of unleashing a pure emotional torrent and rocking even the most steady person to the core. As the last strains of Shadow Of The Hierophant sounded through the pa and the house lights came up I did see a gathering of people heading out to the bar or to the toilets (which are poor if your a male as in there aren’t enough) when I returned to my seat I noticed a few people around fellow Genesis fan community website guy Simon Funnel who runs The Genesis Movement website and whilst I would have popped over to say hello he looked rather swamped. Another notable Genesis community member in the audience tonight was Alan Hewitt from The Waiting Room, he had his own party of people around him so I assumed it would be rude to intrude on them and as I was out with guests anyway and it would have been rude to have abandoned them. 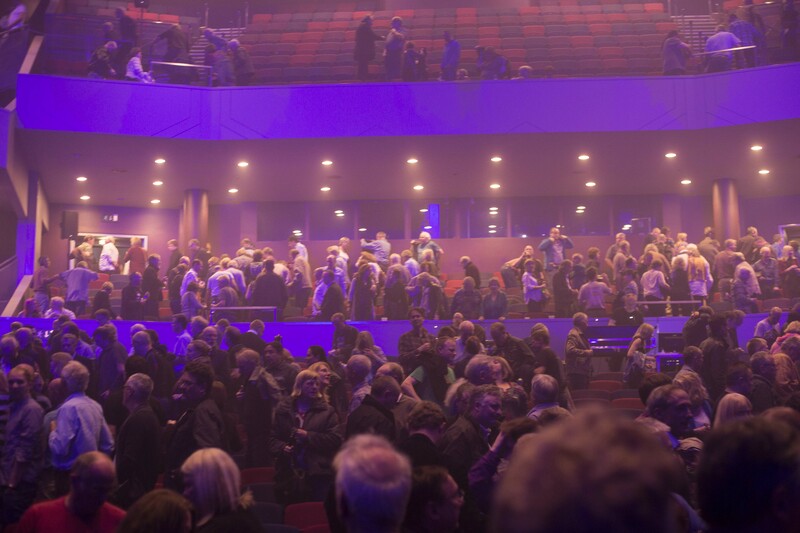 Soon enough the house lights dimmed whilst there was more stragglers waiting to return then Get ‘Em Out By Friday must have been a mind blowing trip back to the Genesis Live album for some of the audience. Nad does indeed put his own spin on it and whilst there is 21st century audio technology on stage to make sure this nostalgic trip is brought to you by more reliable instruments it was very well received by the audience. Cinema Show had all the care attention required with delicate cymbal flourishes by Gary O’Toole, plus the added elements Rob Townsend oft brings through his expertise with wind instruments. Of course no encouragement was needed for the audience to join in the “Nah, nah, nah…” sections. Amusingly, during the first encore of the evening at the beginning of Clocks (The Angel of Mons) audience members were calling out for The Knife and Supper’s Ready, but what they may have missed was the fact those ticking clock sounds were coming from the front and rear speakers to give a more immersive feel which certainly worked in my opinion. Of course some of the Genesis die hard fans would be in for a treat with Firth Of Fifth being played in full and in the latter part Steve’s vegetarian guitar which would send the shivers of authenticity down anyone’s spine and if you’re very alive should have been one of a few goose bump moments of the evening. The audience give a standing ovation – DMH 2015. Considering the band were in Liverpool the night before performing at 100% and being filmed for the forthcoming live DVD you would never have guessed as they were energetic and playful as a comfortable band normally is, no sign of exhaustion or a lack of enthusiasm. I was invited to the after show gathering where I met up again with Gary O’Toole who still had bags of energy. We discussed the progress of the Kickstarter campaign and generally caught up on things. Nad who was rather zany flowed through the backstage area looking rather ethereal and lovely as always. Steve was rather busy as was his wonderful wife Jo, but I managed to say thank you for this evenings performance. Before I left I had a quick chat with all round nice fellow Graham Collins who could only make this gig owing to his own busy schedule, but it was nice to finally have a chat. Time soon came for us to leave the gathering and as I made my way back to the car I bumped into a rather personable fan who was beaming with enthusiasm post show after that interesting conversation I said goodbye to Lamia and his wife as they were staying in Leicester. Leicester’s show felt a lot longer than almost a week ago mind you time certainly flies. 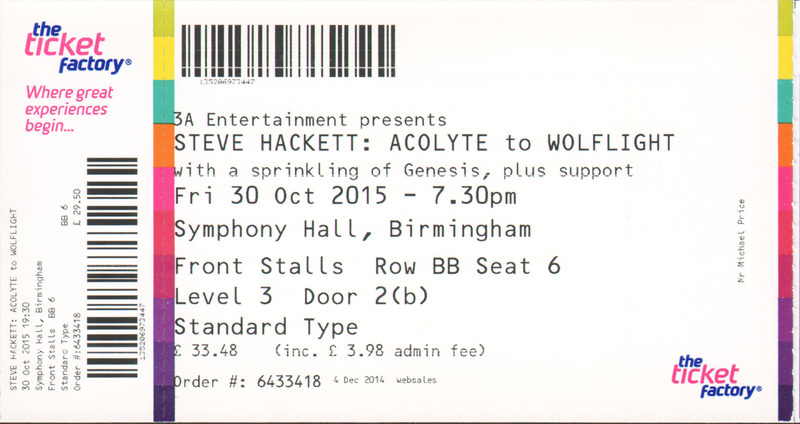 The Symphony Hall in Birmingham is lovely having previously seen various shows including Hackett November the previous year, thus becoming accustomed to it well. We got on the train to Birmingham but it was delayed (thanks to London Midland for that) leading us to worry as we had planned on meeting Steve before the show (similarly the same happened in 2014). As we walked into the venue we could see the merchandise desk looked very busy so we left Paul to it. We made it in time to the stage door and the staff enquired who we were naturally, and as soon as that was confirmed we were whisked through the doors in which we bumped into Jo Hackett who was expecting us. After talking to Jo and discussing Iceland (they had previously visited) and imploring the Hackett’s to listen to Bjork’s Biophilia, we all got in this rather small lift and we went upstairs for a chat. After a lovely chat (our interview was rearranged for another time) and a catch up we made our way to our seats and it was then that we noticed photographer Alan Perry around trying to get a good spot for taking photos. We noticed our seats were facing the right hand side PA so our view of the stage was a little restricted but not to the detriment of the show. The show began the lights dimmed and Corycian Fire started so we knew what was coming and as quick as a flash Spectral Mornings began. There was a few minor twangs of the guitar or a few missed beats in the expected spots that is something you get with live music and it transmits to the audience that the stage is manned by humans and not robots. John Hackett guested again on Jacuzzi with Steve was another delight which was well timed in the set to pace things appropriately. Shadow Of The Hierophant worked better in the larger venue that is Symphony Hall with the ending sounding rather menacing and getting louder by the bar of the beat. During the interval I had a quick chat with Ben on sound, just as I was returning to my seat the lovely Sharon Chevin asked if I could grab a few photos for her of tonight’s performance. I was a little late getting back to my seat so I handed the camera to Michael and I repeated what Sharon had said, and off he went. Rob Townsend blowing a gale, enchanting the audience with Soprano Sax. So the Genesis set began and I just sat there and took it all in my stride, I made sure Michael had all the encouragement he needed as he strode off to take some photos and I relaxed. Well Steve is clearly encouraging the audience by setting the tempo with his fist pumps! I was a bit taken aback at how quickly the closing song of the second set appeared and whilst the band took their bows it wasn’t too long before Clocks and then Firth Of Fifth were over and that was the conclusion of a another evening’s performance (I must have been rather tired). 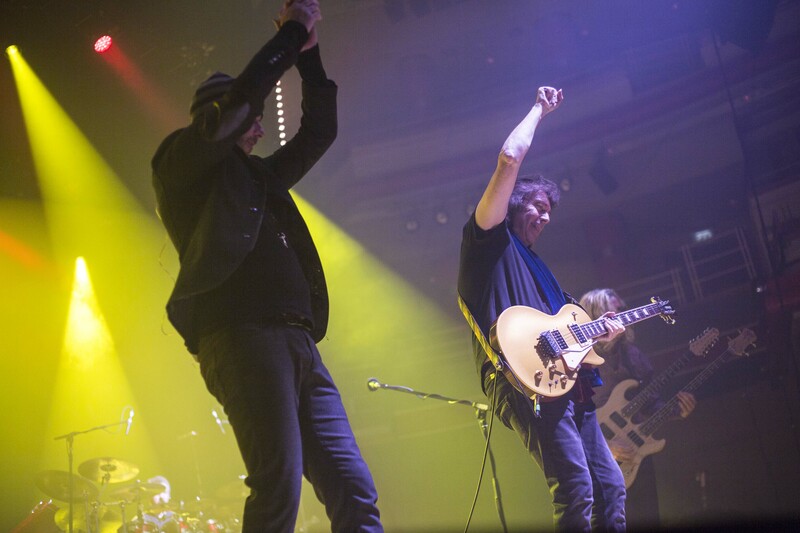 The band take a well deserved bow: End of the show in Birmingham- Steve grabs hold of his brother John. 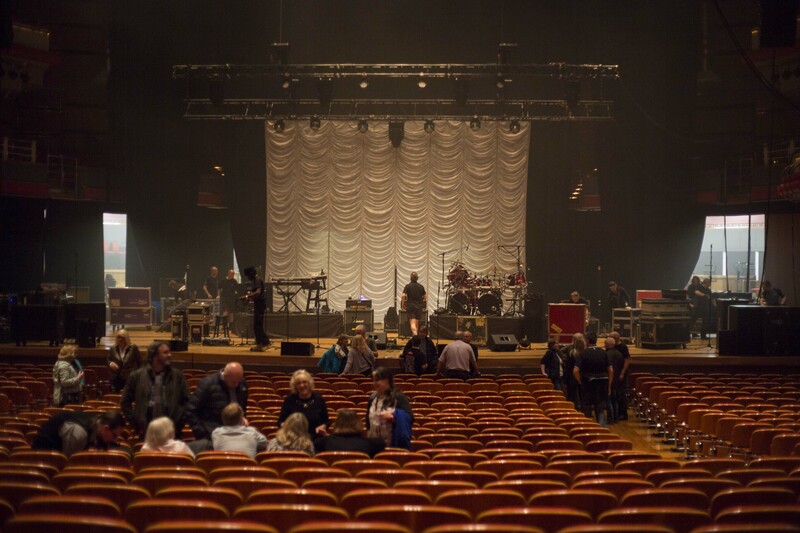 The crew pack away the instruments whilst a few fans stay – Birmingham 2015. Whilst I would not pretend that this was my favourite show of the tour, the show managed to work some of its magic because and rightly so I was able to get lost in the music and performance for a number of the songs although I can recollect how. Before we left we said hello to Paul on the merchandise desk, I told him how I was going to be at the Southend gig tomorrow with Lamia coming out all the way from Holland again, he shook his head in disbelief and laughed. Finally back on the train teasing us by alighting at every stop between, then a dash home for an early night (ha ha ha) before tomorrow’s journey. 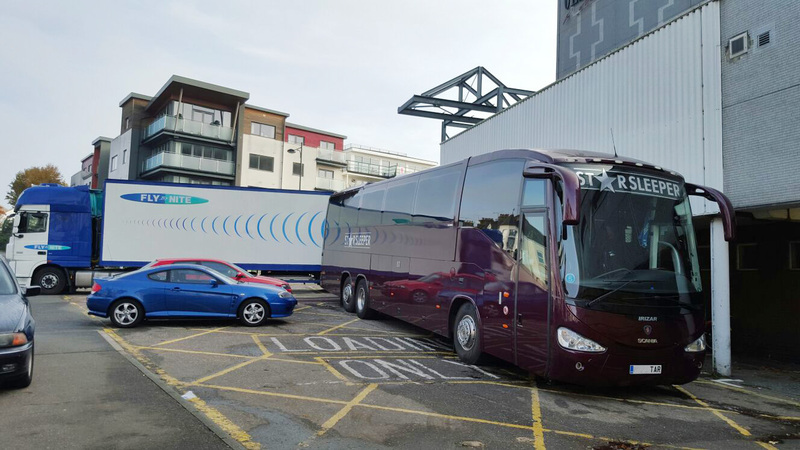 I am not sure if it was Lamia or myself that motivated nee dared each other to attend the last UK show of the tour, but I booked the hotel room and he booked his ferry making the commitment as well the tickets for the show. I set off from the Midlands around midday stuck in the previous night’s haze wearing it on my face like a sodden cloth. The weather the antithesis of myself, rather sunny in comparison. Arriving to Southend after 3pm and speedily booking into the fresh and modern Holiday Inn, although the view overlooking the airport was interesting if a tad drab. After the warm drive and settling in, grabbing a shower and bite to eat I met up with Lamia in the hotel bar, ordered a cider before taxiing to the venue. Jumping out the taxi we bumped into Nad Sylvan and Roine Stolt who had been out on a small walk into Southend to make the most of the mild weather. We didn’t keep them long although we exchanged nice words and handshakes before we looked around the venue upon realising it is open during the day as a bar and snack bar. We found a table and caught right up with my experiences of the show the night before in Birmingham and how lovely the Symphony Hall is and how the bigger venue gave the production a chance to stretch its legs. We sat and drank and chilled out whilst I toyed with the idea of going to the famous Kursaal; its seemingly a shadow of its former self and trip advisor had not been kind to it. As we were actually in Westcliff rather than Southend, and feeling lazy after that drive, I didn’t broach the idea to Lamia that we could have killed time in Southend so we had a brief chat with Paul on the merchandise desk and we saw the bar area fill up with people, we could hear Steve sound checking for the evening’s gig and it sounded good from the bar. There were a few people dressed up as it was Halloween after all, but they we’re just passing through on a night out in Southend. Owing to time constraints and the band wanting to spend at least one extra night in their own beds the after show gathering was cancelled, in it’s place was a minor pre show gathering that saw Lamia and I backstage with the lead singer of a Steely Dan tribute band. Whilst Lamia and the lead singer of the Steely Dan tribute band had a good chin wag with Steve, I had a chat with Jo during which I thanked her for finding the time tonight to see us amongst some other business including asking her about Wolflight, I also found time to chat with Nick Clabburn who is a friend of Steve and John Hackett with the topic mainly about the John Hackett album’s Checking Out Of London and Another Life of which he is the lyricist. Our time backstage concluded and now a beaming Lamia with at least six good photos of him with Steve it was time to order our drinks and press on with the gig, now for the trainspotters amongst you Steve Hackett has a history with this venue as well performing here as far back as 1983, 1988 (both of which were acoustic performances) and then fast forwarding to 2014 and then to this show in 2015. It didn’t seem that long before we were taking our seats after an amusing chat with Ben on the sound desk he reminded me that most shows at the end of a leg of a tour aren’t massively different, that said I continued to my seat as Lamia was already in his seat. The venue is rather big and whilst there was not 100% attendance it was close to 85% by the start of the show. The familiar intro music of Corycian Fire began and I along with Lamia knew what was ahead of us, whilst I didn’t capture the opening moment on camera I did my best to snap some photos but it seems I left my photography skills at home. Richard the guitar tech can just be seen having escorted Steve to the stage and making sure his guitar is plugged into the amps securely. Whilst the snippet of the brand new song Corycian Fire was being played as an intro moments before Spectral Mornings is fired from the canon into the audience, I managed to capture the moment that most of the audience were unaware of. 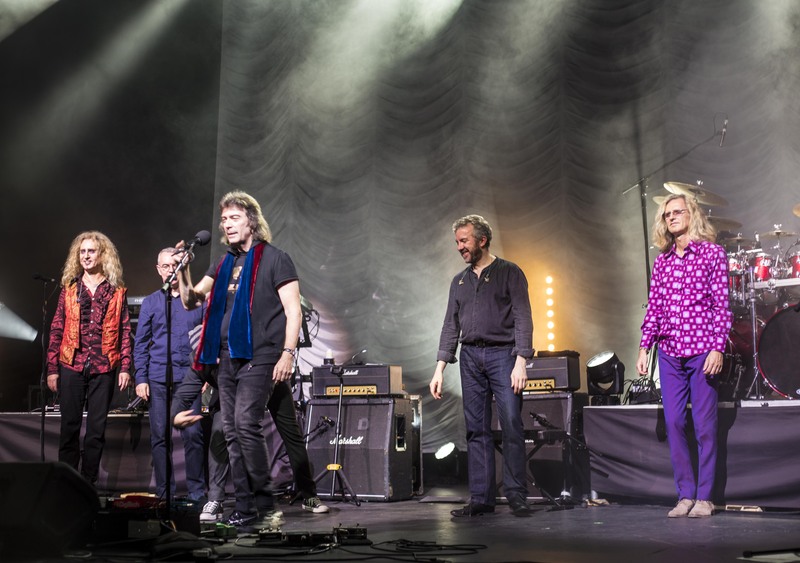 This show was the final farewell to the UK leg and European tour and it started moments after this photo, Show number four was off and running. I did get annoyed at myself because of my lack of photography skills and unfamiliarity with the decent camera I had on me this did indeed spoil the show at the beginning and I only stopped sulking during the encores when Glyn and I messed about. Another photo from Everyday I think? Sadly Jacuzzi was not performed tonight mainly because John Hackett was not in attendance another whilst I am sure Steve could have played an acoustic set in it’s place as he had done on previous tours that option was not exercised either despite that, the band were in a playful mood to the extent of which they even got in on the fact it was Halloween, more on that later! Just after Steve welcomed the audience to the show it was time for the anti drug song Everyday. Next up was more modern material in the form of Love Song To A Vampire which brought the band right back to the latest album continued by The Wheel’s Turning. By this, the fourth show, it was impressive to see how well the set list worked together, each song moved carefully from one to the next stopping at most points along Steve’s career. It would have been interesting to see a show without the Genesis second half as there were some a lot of quality numbers from Steve’s solo work that could easily have rivalled the intensity and soundscape of the Genesis material with the removal of Firth Of Fifth for example. The choices of Star Of Sirius from Voyage Of The Acolyte as well as Icarus Ascending from Please Don’t touch are inspired in many ways of course these are not songs you would remove from the set neither would anyone who was sane take Shadow Of The Hierophant out of the running order. I do personally feel that not having any song from Defector was a missed opportunity but then that is what hindsight is for, the set which Steve had chosen worked well. Just before the band disappeared off stage for 5 minutes and then they returned for an encore well two actually. Clocks, most often played as part of an encore, saw Steve don a Witches Hat which to be fair was a little surreal with the sound of Clocks going on all around the venue and then those menacing bass pedals. In fact Nad also got involved in the Halloween spirit by sporting rather ghoulish zombie-esque makeup for the night. This turned Get ‘Em Out By Friday into a slightly bizarre moment further punctuated by the coincidental irony of the show being in Southend which is in the same county (Essex) as the lyrics which mention Harlow New Town an irony I feel was lost on most of the audience. For the encore I along with Lamia jumped into spare seats at the front joining Glyn Protheroe (original lead singer of Genesis tribute band ReGenesis). We laughed and were caught up in the ever bombastic drum solo in Clocks and raucous sub bass of the Moog Bass Pedals,all emblazoned in strobing flashes of light meanwhile Lamia got dragged back to his seat by the venue staff but somehow Glyn and I clung on. After the show I looked through some of the photos and chatted with Robin Prichard (A good photographer and fellow fan) who tried to give some tips to improve the concert photography, although being quite tired I don’t think it sunk in. It was great catching up with Glyn and Robin (as well as others throughout the tour) although it was sad to have missed some – sorry Volker! We hung about for a bit and chatted again with Paul who by now only had T shirts in small after this shocking discovery we headed outside, to witness that a few fans hung back hoping to meet Steve and the band….. we waited a while as everyone else dived into their taxi’s we had a brief chat with Rob Townsend and then we got into our Taxi having asked the driver how to procure some local delicacy we made our way out to the only open fish and chip emporium (chippy) in town (we had left it too late for any other option or fish emporium by dawdling after the show). My photo of Steve in the witches hat, the mic stand photobombs the moment. We got to the hotel, tucked into our fish and chips and by then it was midnight. Lamia had to catch the early ferry so we were both up super early for breakfast on the foggiest morning of the year which grounded a flight crew who were also at breakfast. We bumped into a disabled guy (who’s name I think was Colin or Rob) who’s car opens up in a rather trick way – pimp my ride eat your heart out, So had a chat with him as he was at last nights gig (he was letting his assistance dog take a morning break), Lamia said his goodbye’s and he made a dash home for his ferry whilst I had to leave to begin my journey back to Coventry with the fog following me home pretty much. This tour was the first proper tour I had taken part in since 2009 so I made sure I was going to see at least four gigs, you never know when Steve will take a well earned rest so I got my fill! if I may be so bold it would have been interesting to hear the Genesis song Time Table in the set in place of Can-Utility And The Coastliners. 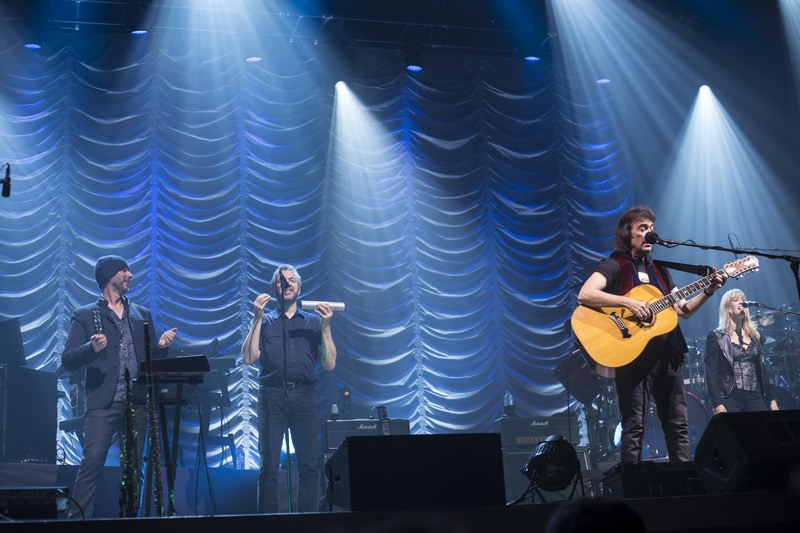 Steve & Jo Hackett for being so supportive, energetic, generous with their time on this tour! Gary O’Toole for being supportive, energetic and generous – especially at Leicester. The Band for being so lovely on both sides of the stage even when off duty! Ben on sound, a true sounding post and to Tigger who may not see his name in lights but who does an illuminating job! Brian Coles for being professional but also kind!. Lamia and his wife at Leicester what a night!, Lamia at Southend for a jolly boys outing! Chris Simmons for almost being at Southend! Paul on the merchandise desk, Rock ‘n’ Roll! Anyone I may have spoken with on the tour!